St. Joseph Catholic School provides an environment to ensure learning where the history, beliefs, and practices of the Catholic Church are taught and lived. Our aim is to provide an environment where there is respect for all creation and where students are viewed as individuals with individual needs, interests and modes of learning. We emphasize a challenging core curriculum that stimulates students to question, evaluate, discover and create. Students encounter a broad variety of learning experiences that blend the traditional and the innovative. These experiences foster every student's ability to shape the world through his or her ideas and vision. In addition to the core curriculum, we offer Spanish, P. E., music, technology, and band. 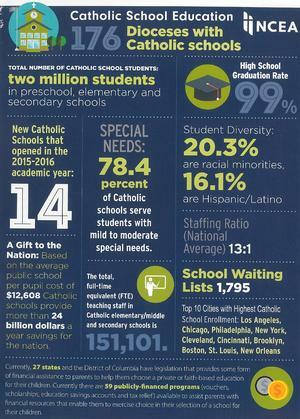 Every parishioner that wants their child to have a Catholic education can afford to be at St. Joseph School.